UPDATE: Universe Cards ARE NOT redeemable code cards like the previous 5x Boost set. When the checklist for Topps Update Baseball was released, we saw that another program for Bunt would be included in the box break, similar to the 5x redemption code cards that were done in Topps Series 2 Baseball. These code cards can be redeemed for digital cards in the app, all of which will have no more than 25 copies. Because the baseball season is over, save the playoffs, these cards are more collection pieces than play mode boosts. The new set is live now, and from the image attached, it is named “Universe.” The design features a space themed concept behind the player, something much different from the original cards. The checklist features some of the bigger names in the sport, and will definitely be among the most coveted non-pack pulled inserts in Bunt. I was lucky enough to come away with Matt Harvey back when Series 2 came out, and was able to trade it for many, many valuable cards. Even without a boost attached, or playability for 2016 in the mix, these cards are worth your time to track down in the physical hobby boxes of Update. Even though they are going to be some of the toughest pulls in the product, the cards are of no equal. There are team collectors who will be scouring ebay to get their hands on these cards, and if you pull one, you could make some serious money. 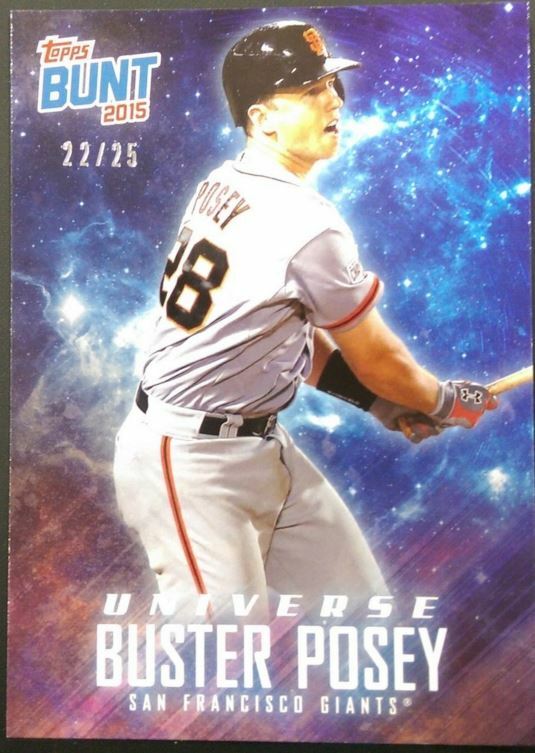 More importantly, because Topps master set collectors on the physical side are always in play, there is no guarantee all the cards will be A) pulled to their entire print run of 25, or B) redeemed once pulled. Although the set is more well known thanks to the prices it received last time around, some collectors of physical cards might still be in the dark. Either way, I am IN LOVE with the idea of including code redemption cards and pack codes in a physical product, and I hope that this continues into 2016. This could serve as a huge win for both the digital team and the physical team, especially if cross over purchases take place between the groups. This entry was posted in Gameplay Tips, News and tagged Baseball Cards, Bunt, Football Cards, Huddle, Sports Cards, Star Wars, Star Wars Card Trader, topps, Topps Bunt, Topps Huddle, Topps Star Wars. Bookmark the permalink. These are already trending down in price once folks figured out they are not like the cards in Series 2. One seller is offering the Teixeira cardin which he has the physical card and will then trade you the Bunt version. Hmm. This could confuse newbies later on. Even now am betting some folks will confuse the two cards in this case. Are the 2015 redemption cards still redeemable in bunt?